Kids, teens, and adults alike LOVE to play our Laser Toss flying disc game. This space-themed game features colorful planets and a scoring system. It's great for fairs, teen events, parties, and fund raisers. Watch your profits soar with this compact, low maintenance, low cost game. 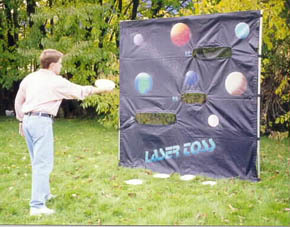 The Laser Toss can be set up in less than five minutes and can be used indoors or out.